If you’re wondering which 14 bolt axle you have – full-float or semi-float, dual rear wheel or single rear wheel, slide-on drum or stud mounted drum – the chart below will help you figure it out. NEW: You can download a printable version of the chart below here. You can’t really go off year, make, and model. 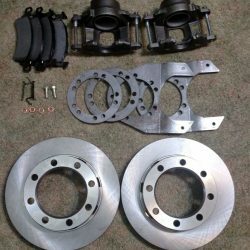 A lot of parts can be purchased just by looking up your vehicle’s year make and model. We don’t recommend this for older trucks…part of the issue is equipment can differ from one vehicle to the next, and part of the issue is that you never if a previous owner modified your truck and swapped out the rear axle. You probably want to remove one of the rear wheels to figure out what you have. 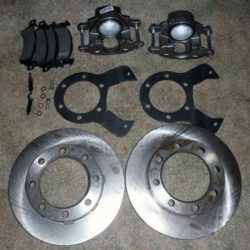 While you might be able to look at your truck and tell what you have with the wheels on, removing a wheel is the best way to figure it out. 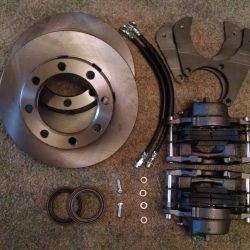 Once you figure out which axle you have, you can find the right disc brake conversion kit for your single rear wheel axle here.